The Letter of Jeremiah, also known as the Epistle of Jeremiah, is a deuterocanonical book of the Old Testament; this letter purports to have been written by Jeremiah to the Jews who were about to be carried away as captives to Babylon by Nebuchadnezzar. It is included in Catholic Bibles as the final chapter of the Book of Baruch. It is also included in Orthodox Bibles as a standalone book. Some scholars claim that the title of this work is misleading, as they consider it to be neither a letter nor written by the prophet Jeremiah. According to the text of the letter, the author is the biblical prophet Jeremiah. The biblical Book of Jeremiah already contains the words of a letter (Jer 29:1–23) sent by Jeremiah "from Jerusalem" to the "captives" in Babylon. The Letter of Jeremiah portrays itself as a similar piece of correspondence. A copy of an epistle, which Jeremy sent unto them which were to be led captives into Babylon by the king of the Babylonians, to certify them, as it was commanded by God. Now these are the words of the letter that Jeremiah the prophet sent from Jerusalem unto the residue of the elders which were carried away captives ... and to all the people whom Nebuchadnezzar had carried away captive from Jerusalem to Babylon. As E. H. Gifford puts it, "The fact that Jeremiah had written one such letter to the captives seems to have suggested the idea of dignifying by his name another letter not written in reality till many ages after his death." Against the traditional view, most contemporary scholars agree that the author was not Jeremiah. The chief arguments put forward are literary quality, as well as the religious depth and sensitivity. J. T. Marshall adds that the use of "seven generations" (v. 3) rather than "seventy years" (Jer 29:10) for the duration of the exile "points away from Jeremiah towards one who deplored the long exile." The author may have been a Hellenistic Jew who lived in Alexandria, but it is difficult to say with certainty. The earliest manuscripts containing the Epistle of Jeremiah are all in Greek. The earliest Greek fragment (1st century BC) was discovered in Qumran. Gifford reports that in his time "the great majority of competent and impartial critics" considered Greek to be the original language. As one of these critics O. F. Fritzsche put it, "If any one of the Apocryphal books was composed in Greek, this certainly was." The strongest dissenter from this majority view was C. J. Ball, who marshalled the most compelling argument for a Hebrew original. However, Yale Semitic scholar C. C. Torrey was not persuaded: "If the examination by a scholar of Ball's thoroughness and wide learning can produce nothing better than this, it can be said with little hesitation that the language was probably not Hebrew." Torrey's own conclusion was that the work was originally composed in Aramaic. In recent years the tide of opinion has shifted and now the consensus is that the "letter" was originally composed in Hebrew (or Aramaic). The date of this work is uncertain. Most scholars agree that it is dependent on certain biblical passages, notably Isa 44:9–20, 46:5–7, and thus can be no earlier than 540 BC. Since a fragment (7Q2) was identified among the scrolls in Qumran Cave 7, it can be no later than 100 BC. Further support for this terminus ad quem may be found in a possible reference to the letter in 2 Maccabees 2:1–3. Now in Babylon you will see carried on men's shoulder's gods made of silver, gold, and wood, which fill the heathen with awe. Be careful, then, never to imitate these Gentiles; do not be overawed by their gods when you see them in the midst of a procession of worshippers. But say in your hearts, "To thee alone, Lord, is worship due." The records show that it was the prophet Jeremiah who ordered the exiles ... not to neglect the ordinances of the Lord, or be led astray by the sight of images of gold and silver with all their finery. As mentioned above, the use of "seven generations" rather than "seventy years" points to a later period. Ball calculates the date to be c. 307 – 317 BC. And Tededche notes: "It is well known that many Jews were attracted to alien cults throughout the Greek period, 300 BC onward, so that the warning in the letter might have been uttered any time during this period." 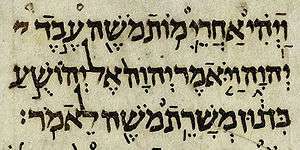 Although the "letter" is included as a discrete unit in the Septuagint, there is no evidence of it ever having been canonical in the Masoretic tradition. The earliest evidence we have of the question of its canonicity arising in Christian tradition is in the work of Origen of Alexandria, as reported by Eusebius in his Church History. Origen listed Lamentations and the Letter of Jeremiah as one unit with the Book of Jeremiah proper, among "the canonical books as the Hebrews have handed them down," though scholars agree that this was surely a slip. Epiphanius of Salamis in his Panarion writes that Jews had in their books the deuterocanonical Epistle of Jeremiah and Baruch, both combined with Jeremiah and Lamentations in only one book. Athanasius of Alexandria mentions the same, he includes the deuterocanonical Epistle of Jeremiah and Baruch as a part of the Old Testament Canon, both combined with Jeremiah and Lamentations in only one book. Cyril of Jerusalem states in his list of canonical books "of Jeremiah one, including Baruch and Lamentations and the Epistle"
The Synod of Laodicea (4th Century) wrote that Jeremiah, and Baruch, the Lamentations, and the Epistle are canonical in only one book. Jerome provided the majority of the translation work for the vulgar (popular) Latin translation of the Bible, called the Vulgate Bible. In view of the fact that no Hebrew text was available, Jerome refused to consider the Epistle of Jeremiah, as the other books he called apocryphal, canonical. Despite Jerome's reservations, the epistle is included as chapter 6 of the Book of Baruch in the Old Testament of the Vulgate. The King James Version follows the same practice, while placing Baruch in the Apocrypha section as does Luther's Bible. In the Ethiopian Orthodox canon, it forms part of the "Rest of Jeremiah", along with 4 Baruch (also known as the Paraleipomena of Jeremiah). The epistle is one of four deuterocanonical books found among the Dead Sea scrolls (see Tanakh at Qumran). (The other three are Psalm 151, Ben Sira, and Tobit.) The portion of the epistle discovered at Qumran was written in Greek. This does not preclude the possibility of the text being based on a prior Hebrew or Aramaic text. However, the only text available to us has dozens of linguistic features available in Greek, but not in Hebrew; this shows that the Greek text is more than a minimalist translation. The "letter" is actually a satire, or harangue, against idols and idolatry.Bruce M. Metzger suggests "one might perhaps characterize it as an impassioned sermon which is based on a verse from the canonical Book of Jeremiah." That verse is Jer 10:11, the only verse in the entire book written in Aramaic. Tell them this: "These gods, who did not make the heavens and the earth, will perish from the earth and from under the heavens." The work was written with a serious practical purpose: to instruct the Jews not to worship the gods of the Babylonians, but to worship only the Lord. As Gifford puts it, "the writer is evidently making an earnest appeal to persons actually living in the midst of heathenism, and needing to be warned and encouraged against temptations to apostasy." The author warned the Hebrew exiles that they were to remain in captivity for seven generations, and that during that time they would see the worship paid to idols. Readers were extolled not to participate, because the idols were created by men, without the powers of speech, hearing, or self-preservation. Then follows a satirical denunciation of the idols. As Gifford explains, in this folly of idolatry "there is no clear logical arrangement of the thought, but the divisions are marked by the recurrence of a refrain, which is apparently intended to give a sort of rhythmical air to the whole composition." The conclusion reiterates the warning to avoid idolatry. ↑ Moore 1992, 3:703; Pfeiffer 1949, 427. ↑ One exception is the Roman Catholic commentator F. H. Reusch, Erklärung des Buchs Baruch (Freiburg im Breisgau: Herder, 1853). For a critique of his position as well as an English translation of portions of his work, see Gifford 1888, 288. ↑ Moore 1992, 704; cf. Marshall 1909, 578. ↑ Marshall 1909, 579; cf. Gifford 1888, 302; Ball 1913, 596. ↑ Charles 1911, 325; Westcott 1893, 361; Gifford 1888, 290. ↑ Gifford 1888, 288; cf. Torrey 1945, 65. ↑ Fritzsche 1851, 206 as translated by Gifford 1888, 288. ↑ Ball 1913, 597–98, and throughout the commentary; cf. Gifford 1888, 289. ↑ Torrey 1945, 65; cf. Oesterley 1914, 508. ↑ Torrey 1945, 66–67. Pfeiffer 1949, 430, supports Torrey's Aramaic proposal, though noting that "its Hellenistic Greek style is fairly good." ↑ Metzger 1957, 96; Moore 1977, 327–27; Nickelsburg 1984, 148; Schürer 1987, 744 (opinion of revisers, Schürer himself thought it was "certainly of Greek origin" [Schürer 1896, 195]); Moore 1992, 704; Kaiser 2004, 62. ↑ Moore 1992, 705; Schürer 1987, 744; Pfeiffer 1949, 429. ↑ Moore 1992, 705; Nickelsburg, 1984, 148; Schürer 1987, 744. Pfeiffer 1949, 429, rejects the reference and cites other rejectors. ↑ Ball 1913, 596; cf. Moore 1977, 334–35. ↑ Marshall 1909, 579; Schürer 1987, 744. H. J. Lawlor and J. E. L. Oulton, Eusebius: The Ecclesiastical History, 2 vols. (London: SPCK, 1927), 2:216, write: "the text of the list which lay before Eusebius was corrupt or was carelessly copied." ↑ of Alexandria, Athanasius. Letter 39. newadvent. Retrieved 11 October 2016. ↑ of Jerusalem, Cyril. Catechetical Lecture 4 Chapter 35. newadvent. Retrieved 12 October 2016. ↑ of Laodicea, Synod. Synod of Laodicea Canon 60. newadvent. Retrieved 12 October 2016. ↑ Jerome, Comm. on Jeremiah, praef. Migne PL 24:706. ↑ Benjamin G Wright, 'To the Reader of the Epistle of Ieremeias', in New English Translation of the Septuagint. ↑ Moore 1992, 703; cf. Dancy 1972, 199. ↑ Metzger 1957, 96. Also endorsing its sermonic character are Ball 1913, 596; Tededche 1962, 822; Vriezen 2005, 543. ↑ Gifford 1888, 290. Oesterley 1914, 507, says much the same thing: "That the writer is seeking to check a real danger ... seems certain from the obvious earnestness with which he writes." ↑ Gifford 1888, 287. The refrain occurs first at v. 16 and then is repeated at vv. 23, 29, 65, and 69. Baars, W. (1961). "Two Palestinian Syriac Texts Identified as Parts of the Epistle of Jeremy," Vetus Testamentum 11:77–81. Baillet, M., et al., eds. (1962). Les "Petites Grottes" de Qumran, 143. Discoveries in the Judean Desert III. Oxford: Clarendon Press. Otto Fridolin Fritzsche (1871). Libri Apocryphi Veteris Testamenti Graece. F.A. Brockhaus. p. 102. Rahlfs, Alfred, ed. (1935). Septuaginta, 2 vols., 2:766-70. Stuttgart: Privilegierte Württembergische Bibelanstalt. Henry Barclay Swete (1899). The Old Testament in Greek According to the Septuagint. University Press. p. 379. Weber, Robert, ed. (1994). Biblia sacra: iuxta Vulgatam versionem, 1262–65. Stuttgart: Deutsche Bibelgesellschaft. Ziegler, Joseph, ed. (1957). Ieremias, Baruch, Threni, Epistula Ieremiae, 494–504. Göttinger Septuaginta XV. Göttingen: Vandenhoeck & Ruprecht. Ball, C. J. (1913). "Epistle of Jeremy," in The Apocrypha and Pseudepigrapha of the Old Testament, ed. R. H. Charles, 2 vols., 1:596–611. Oxford: Clarendon Press. Cook, F. C., ed. (1888). The Holy Bible according to the authorized version (A.D. 1611). : With an explanatory and critical commentary and a revision of the translation by elergy of the Anglican church. Apocrypha. J. Murray. p. 287. Dancy, J. C. (1972). The Shorter Books of the Apocrypha, 197–209. The Cambridge Bible Commentary. Cambridge: Cambridge University Press. Moore, Carey A. (1977). Daniel, Esther, and Jeremiah: The Additions. The Anchor Bible 44. Garden City, NY: Doubleday. Charles, R. H. (1911). "Jeremy, Epistle Of," in 'Encyclopædia Britannica, 11th ed. 15:325. Thomas Kelly Cheyne; John Sutherland Black (1901). Encyclopædia Biblica: A Critical Dictionary of the Literary, Political and Religious History, the Archæology, Geography, and Natural History of the Bible. Macmillan. Otto Fridolin Fritzsche; Carl Ludwig Wilibald Grimm (1851). Kurzgefasstes exegetisches Handbuch zu den Apokryphen des Alten Testamentes. Weidmann. p. 205. Otto Kaiser (2004-06-01). The Old Testament Apocrypha: An Introduction. Alban Books Limited. ISBN 978-1-56563-693-4. James Hastings; John Alexander Selbie; Andrew Bruce Davidson; Samuel Rolles Driver; Henry Barclay Swete (1899). A dictionary of the Bible: dealing with its language, literature, and contents, including the Biblical theology. T. & T. Clark. p. 578. Metzger, Bruce M. (1957). An Introduction to the Apocrypha, 95–98. New York: Oxford University Press. Moore, Carey A. (1992). "Jeremiah, Additions To," in Anchor Bible Dictionary, ed. David Noel Freedman, 6 vols., 3:698–706. New York: Doubleday. Michael E. Stone (1984). Jewish Writings of the Second Temple Period: Apocrypha, Pseudepigrapha, Qumran, Sectarian Writings, Philo, Josephus. Fortress Press. ISBN 978-0-8006-0603-9. William Oscar Emil Oesterley (1914). The books of the Apocrypha: their origin, teaching and contents. Revell. p. 506. Pfeiffer, Robert H. (1949). History of New Testament Times with an Introduction to the Apocrypha, 426-32. New York: Harper and Brothers. Emil Schürer (1896). A history of the Jewish people in the time of Jesus Christ. T. & T. Clark. p. 195. Emil Schürer (2000-11-14). History of the Jewish People in the Age of Jesus Christ: Volume 3 (ii) and Index. T&T Clark. ISBN 978-0-567-09373-8. Tededche, S. (1962). "Jeremiah, Letter Of," in The Interpreter's Dictionary of the Bible, 4 vols., 2:822-23. Nashville: Abingdon. Torrey, C. C. (1945). The Apocryphal Literature: A Brief Introduction, 64–67. New Haven: Yale University Press. John Mee Fuller (1893). A Dictionary of the Bible: Comprising Its Antiquities, Biography, Geography, and Natural History. J. Murray. p. 361.